Like you, we have children too! That’s why none of our social networking sites nor our website is targeted at children (minors under thirteen years of age) and we do not knowingly collect personally identifiable information from children who have not obtained parental consent. It is our intention to comply fully with the Federal Children’s Online Privacy Protection act of 1998 (COPPA). Don’t worry. Your personal information is safe. We are committed to protecting the personal information that you share with us through the Internet. Cotton Patch Cafe will not trade, sell or share your personal information for use by any third parties unless we have informed you, been authorized by you or are required by law to do so. Use of Cotton Patch Cafe, Inc. registered trademarks, service marks, designs and/or a logo without prior express written consent of Cotton Patch Cafe is prohibited. The Cotton Patch Cafe website contains content created by us as well as content created or provided by third parties. Due to human error or for unknown technical reasons, there may be inadvertent inaccuracies, typographical errors in the content of our website. For those reasons, we do not guarantee the accuracy, integrity, completeness or quality of the content on our website or that which may be located at third party URLs that may be posted on our website. Unintended errors or defects on our website will be corrected within 30 days of written notification. Cotton Patch Cafe will not be liable for any specified damages or injury caused by, including, but not limited to, any Internet or ISP failure of performance, error, omission, defect, interruption, computer virus, delay in operation of transmission, or line failure. Cotton Patch Cafe will not be liable for any damages or personal injury, including but not limited to, special or consequential damages, that result from the use of, or the inability to use, the materials in this site, even if there is negligence by Cotton Patch Cafe, or an authorized Cotton Patch Cafe representative has been advised of the possibility of such damages, or both. The above limitation or exclusion may not apply to the extent that applicable law may not allow the limitation or exclusion of liability for incidental or consequential damages. Cotton Patch Cafe’s total liability for all losses, damages, and causes of action will not be greater than the amount paid to access this site. 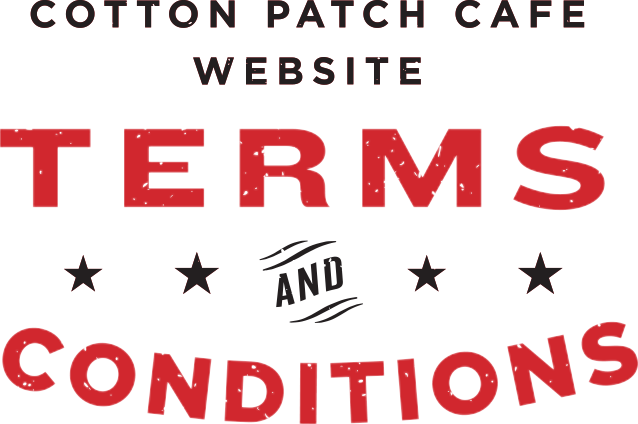 Your voluntary entry into the Cotton Patch Cafe website grants Cotton Patch Cafe the express right to transmit and send restaurant offers, certain advertising and other notifications to the email account you provided us. E-Club members may opt out of the Cotton Patch Cafe E-Club at any time by utilizing the unsubscribe links located at the bottom of our E-Club transmissions.